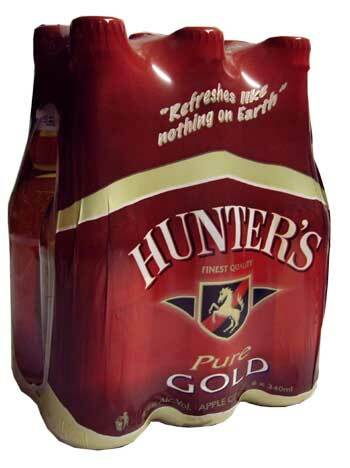 Hunters cider is South Africa best selling cider. Hunters Gold has a sweet refreshing taste that can quench the ultimate thirst. Best served ice cold to enjoy its sparkling refreshment. A South African friend of mine once had some of this imported for his birthday. Like a child I drank from the bottle quickly and swallowed the golden fluid without trying to appreciate its full and superior flavour. The second time round I take it in slower and I am finding myself spiraling out of control with passion and vibrance. This drink has a subtle approach when being looked at through the bottle but once you take that first sip you will find yourself wanting more and more and until like me you are importing it on a regular basis for special occasions and to toast to life in general that such a fantastic drink has been crafted. It refreshes like nothin on earth..